Recently i Came across the Amended regulation of govt on the issue of the Price of water bottles that is to be charged is the printed price on the bottle, and no water bottles are to be overpriced. Despite of this new rule declared as applicable, the hotels and restaurants aren't following the same. I request govt to kindly look into the said matter and Penalize the respective hotels for rule violation. A proof of bill is attached for Reference. 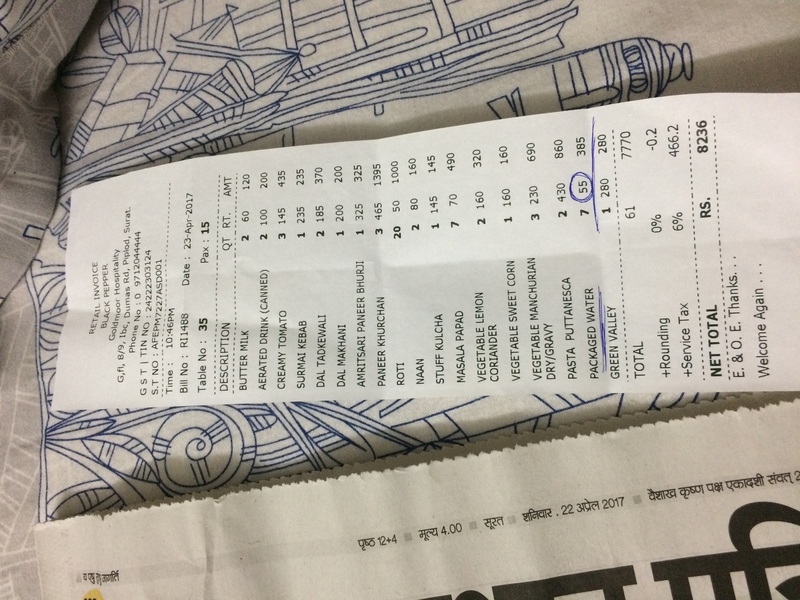 Said is the bill of Surat based hotel Black Pepper, owned and managed by Mr. Mukesh Vaniya, the bottle with the printed price of Rs.20 was charged for Rs.45, when argued with the hotel staff, they strictly denied the request and informed that no such orders has been passed by the management to them for the concerned matter. The staff added, they have received repeated complaints regarding the same and have duly passed on the same to the management, but no response from management on said issue. Request your action on the same.